Telltale Games announced on Twitter last week, with little warning, that it’d be shuttering its doors. The news drew a not-unexpected amount of backlash and scrutiny based on first-hand accounts from the people involved. Now the same Twitter-based community is keeping the company on notice for its messy handling of the situation. To coin a phrase, Gaming Twitter is the loose collection of gaming-affiliated individuals and companies. If it sounds a little odd, think of it this way: Twitter kind of breaks into different demographics, with large groups of people sharing common interests typically following each other. Gaming Twitter typically consists of game developers and publishers, vocal fans, streamers and LPers, and gaming journalists — a motley crew of boisterous personalities at its best. But when they get mad, boy will they let you know. Gaming Twitter was by far the most shocked to hear about the closure of Telltale, particularly as the company’s prolific output would seem to indicate prosperity or at least interest. And it was to Gaming Twitter we first heard accounts of the behind-the-scenes mess that the company had become in its final hours. 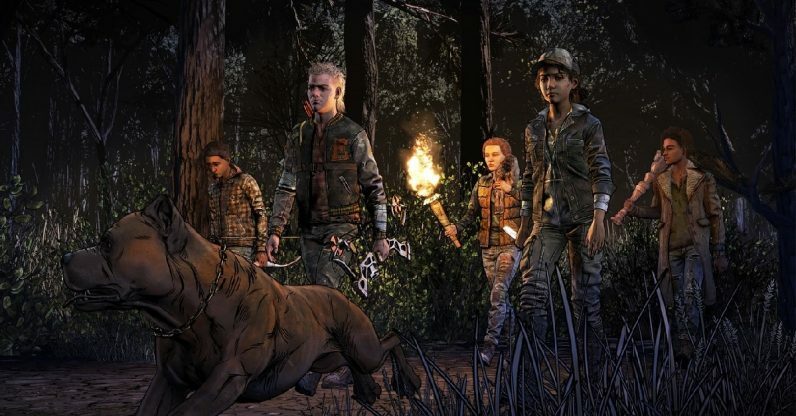 The primary source of outrage stemmed from the news that Telltale wouldn’t be paying its 225 laid-off employees — many of whom had put in long hours of crunch time to get the company’s multiple games out the door on time — any severance. In fact, they were given no warning the company was shutting down and were told they had 30 minutes to leave the building. It’s an absurd nightmare scenario verging on a parody of Mr. Spacely from The Jetsons — only it actually happened. And gaming fans were not pleased to hear the company had chosen to treat its employees that way. It’s gotten to the point where a former employee is suing the company for violating California labor laws. Gaming Twitter did have one question: What was going to happen to the final season of The Walking Dead, Telltale’s flagship series, which was only on its second episode? Several gamers would have already paid for the entire season in advance. Was Telltale going to refund them, or try to finish the season? A relatively minor quibble in the grand scheme, but still a reasonable one. No one seemed to really know, with even Melissa Hutchinson, the voice of my video game daughter Clementine saying she wasn’t certain what was going to happen. Now Telltale has finally addressed at least that question, saying “multiple potential partners” are interested in financing the final two episodes of the series. So the series will be temporarily resurrected, like the zombies who give it the name. Firstly, this isn’t exactly a shock. Telltale was already keeping a tiny group of employees on for a bit longer to finish another project — according to Variety, the company’s Minecraft: Story Mode is still being developed. Secondly, this doesn’t address why any money the company accrues will go to the game and not to the employees. So Telltale is eager to reassure its fans that TWD will be completed anyhow? Really hits home that, when the chips are down, the folks who gave blood, sweat, and tears to bring their vision to life will be last on a company's list of priorities. This whole situation is a nightmare, and Telltale’s executive-level decisions continue to be utterly baffling. Now, when we’ve all lost our jobs, and Telltale is thinking of finishing projects without us, after not giving us severance… I realize they made fans believe it too. That Telltale was what was quality, not the devs actually making the games. But Gaming Twitter is doing their best to help the beleaguered employees, with “#TelltaleJobs” currently making the rounds as people attempt to hook the alumni up with new positions. A few game companies are also pitching their job boards in an attempt to help.